The following chart presents a comparison between the tested lens, its predecessor, and similar lenses offered in rival mirrorless systems. Compared to the competition the Fujinon is the heaviest and noticeably big but it also offers the widest angle of view and the shortest minimum focusing distance. 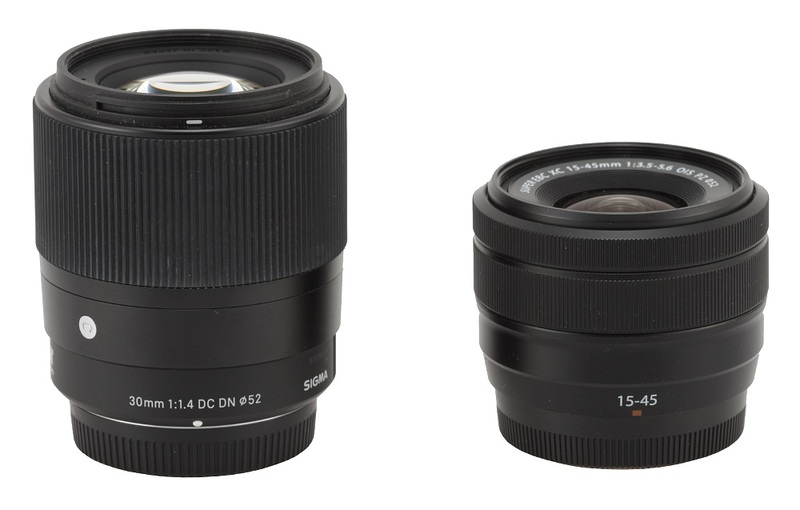 In the photo below the Fujinon XC 15–45 mm f/3.5–5.6 OIS PZ is positioned next to the Sigma C 30 mm f/1.4 DN DC offered in Sony E and Mikro 4/3 mount versions. 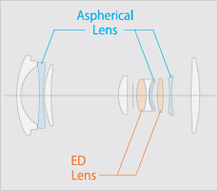 The tested lens starts with a plastic mount which surrounds contacts and a rear, immobile element, 23 mm in diameter. The blackening of the tube from the side of the rear element leaves a bit to be desired, particularly the shiny flex band part. The proper barrel of the lens starts with an immobile ring, 20 mm wide, with a red square, making an alignment with a camera easier. 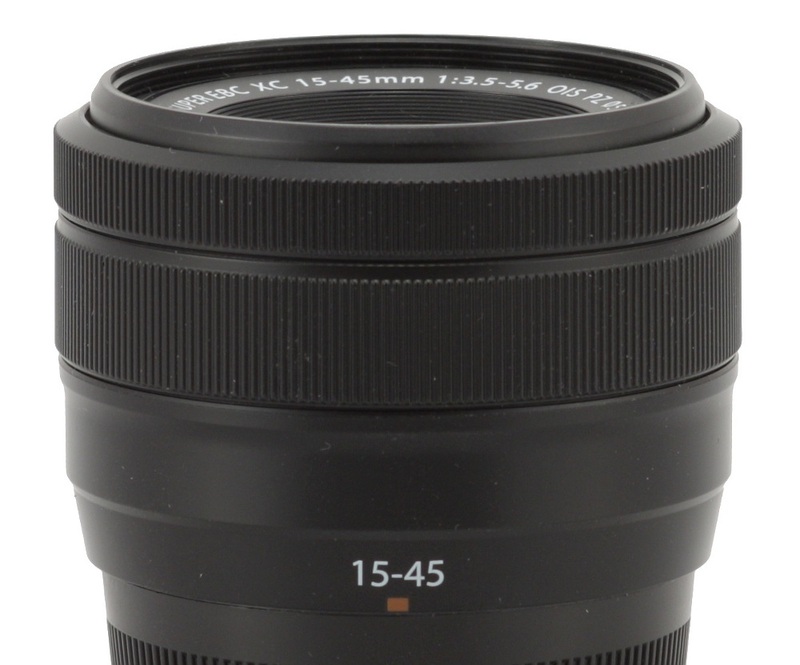 Then you see an inscription 15-45, a sticker with the serial number of the lens, its name and information that it was produced in Philippines. I don’t know how Fuji engineers come up with such ideas but it’s definitely not the first time when I have to deal with the results. All Fuji bodies I’ve used so far disregarded manual focusing in the same fashion. You can set that focus as you wish, take a photo and then, when you want to see a preview and e.g. enlarge a fragment of your frame, the lens, for reasons unknown, changes the position of elements and you can kiss goodbye your carefully –chosen settings. 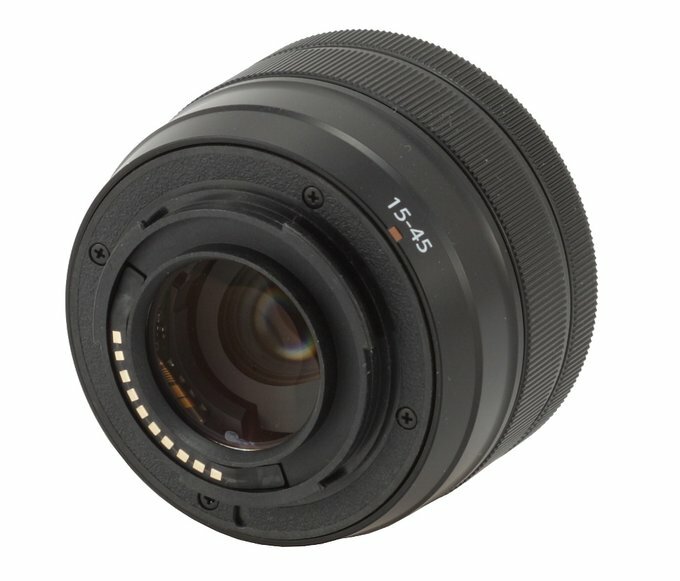 Still it’s worth emphasizing the fact that in the case of the X-T100, a camera which is sold with the Fujinon 15-45 mm as its kit lens, the folding of the lens after passing to the preview mode doesn’t happen and focusing is helped by a special position marker which appears on the display panel. Older bodies could do with such help as well and I hope next software updates will deal with that problem efficiently. 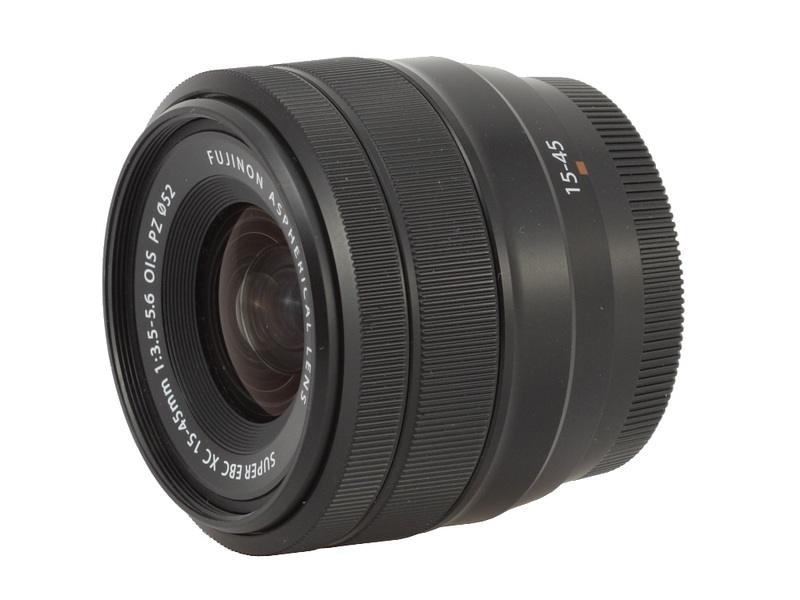 Further on you see a ribbed manual focus ring, 8 mm wide, without any markings. It is a construction based on servomechanisms, turning with little resistance; we found its performance beyond reproach. The front element is 28 mm in diameter, surrounded by an inscription with the name and parameters of the lens and a non-rotating filter thread, 52 mm in diameter. In the folded position the element is situated on the same level as the focus ring. When you switch the camera on the front element extends on a uniform, plastic tube and it becomes 2 cm longer. That tube sticks out from the lens the most for extreme focal length positions. When it comes to optical construction you deal here with 10 elements positioned in 9 groups. There are as many as three aspherical elements among them and two are made of low dispersion ED glass. Inside you can also find an aperture with seven diaphragm blades which can be closed down to f/22 at the maximum no matter what focal length you employ. Buyers get just two caps in the box. 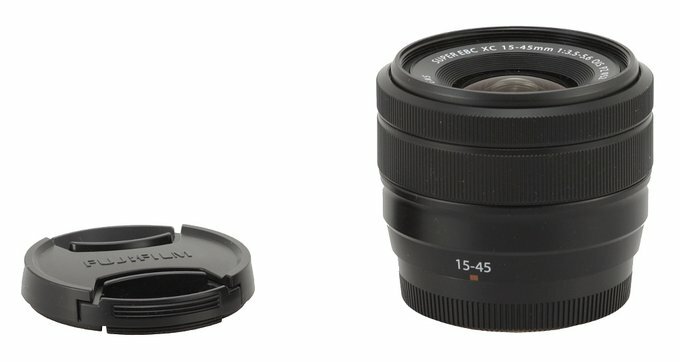 Producers declare that the optical stabilization mechanism of the Fujinon 15-45 mm is as efficient as 3 EV stops. Of course we wanted to check that claim. In order to do so at the 45 mm focal length we took several dozen photos with shutter speeds ranging from 1/80 to 1/2 of a second and the stabilization switched on and off. 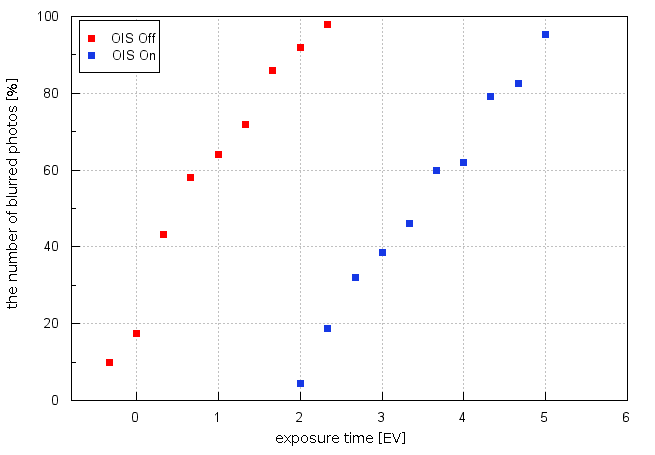 Then we calculated the percentage of blurred photos at every speed and presented the results as exposure time function graph, expressed in EV (with 0 EV being the equivalent of 1/60 of a second), which can be found below. The maximum distance between two curves determines the efficiency of the stabilization mechanism and in this case it amounts to 2.7-3.0 EV, being, within the margin of error, in accordance with the official declarations of the producer. It is also a very sensible result for a simple kit lens.